Need some extra security in your singlespeed setup? Check out the Wheels Manufacturing SSK-3 singlespeed conversion kit with chain guides. With the six included spacers, three included shims and the chain guides, you have tons of flexibility when it comes to adjusting your chainline. On top of that, the included chain guides make sure that you’ll never be dropping your chain, even under the added pressure of racing. 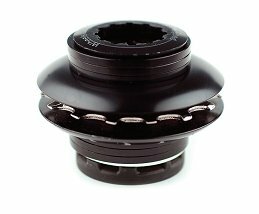 Includes a 16-tooth cog and lockring to complete the package. Fits Shimano splined freehubs.